Without Missing a beat, we move on to the alternative Mac & Cheese. Inspired by Diners, Drive-Ins & Dives, I made Rusty a Mac & Cheese with four cheeses – Fontina, Asagio, Extra Sharp White Cheddar, and Fresh Parmagian. 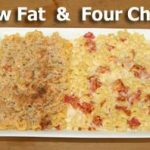 Both of these Mac & Cheese recipes are delicious, but this recipe has a more pungent flavor than the lower fat alternative. As pictured above, I made both of the Mac & Cheese recipes at once, and placed them in an oven safe dish divided by tin foil, and viola – we had a beautiful dish with your choice of pasta. Follow the basic directions for the LowFat Mac & Cheese, but subsitute heavy cream for the condensed milk, add 2 TBSP of butter, and instead of 8oz reduced fat cheddar, user the following. NOTE ABOUT BUYING CHEESE: You may be wondering when purchasing blocks of cheese how much to get. Since the recipe is measured in volume and not weight, purchasing the correct amount of cheese could be difficult…but here is a little tip to help. 1 pound of cheese is about 2 cups. Volume doubles when cheese is shredded, so 1lb of cheese is about 4 cups of shredded cheese. 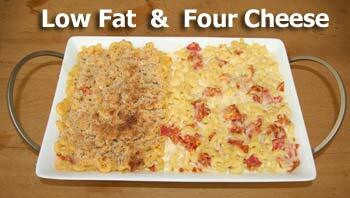 We also added 4 pieces of morning star vegetarian Bacon, chopped and 3 “Smart Deli” slices of ham, chopped.